For the bartender and mixologist of the same name, see Tony Conigliaro (mixologist). Anthony Richard Conigliaro (January 7, 1945 – February 24, 1990), nicknamed "Tony C" and "Conig", was a Major League Baseball outfielder and right-handed batter who played for the Boston Red Sox (1964–67, 1969–1970, 1975) and California Angels (1971). He was born in Revere, Massachusetts and was a 1962 graduate of St. Mary's High School in Lynn, Massachusetts. During the Red Sox "Impossible Dream" season of 1967, he was hit in the face by a pitch, causing a severe eye injury and derailing his career. Though he would make a comeback from the injury, his career was not the same afterwards. Conigliaro was signed by the Red Sox in 1962, at the age of 17. In 1963, he batted .363 with 24 home runs playing for the Wellsville Red Sox in the New York–Penn League, after which he was called up to the majors. During his 1964 rookie season, Conigliaro batted .290 with 24 home runs and 52 RBI in 111 games, but broke his arm and his toes in August. In his first at-bat in Fenway Park, Conigliaro hit a towering home run in the second inning against the White Sox. In his sophomore season in 1965, Conigliaro led the league in home runs (32), becoming the youngest home run champion in American League history. He was selected for the All-Star Game in 1967. In that season, at age 22, he not only reached a career total of 100 home runs, but attained that milestone at the youngest age for an American League player. On August 18, 1967, the Red Sox were playing the California Angels at Fenway Park. Conigliaro, batting against Jack Hamilton, was hit by a pitch on his left cheekbone and was carried off the field on a stretcher. He sustained a linear fracture of the left cheekbone and a dislocated jaw with severe damage to his left retina. The batting helmet he was wearing did not have the protective ear-flap that has since become standard. A year and a half later, Conigliaro made a remarkable return, hitting 20 homers with 82 RBI in 141 games, earning Comeback Player of the Year honors. In 1970, he reached career-high numbers in HRs (36) and RBI (116). That season he and his brother Billy formed two-thirds of the Red Sox outfield. After a stint with the Angels in 1971, he returned to the Red Sox briefly in 1975 as a DH, but was forced to retire because his eyesight had been permanently damaged. 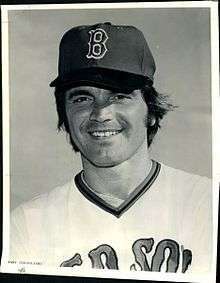 Conigliaro batted .267, with 162 home runs and 501 RBI during his 802-game Red sox career. With the Angels, he hit .222 with 4 home runs and 15 RBI in 74 games. He holds the MLB record for most home runs (24) hit by a teenage player. He is the second-youngest player to hit his 100th homer (after Mel Ott in 1931), and the youngest American League player to do so. During the height of his popularity in 1965, he recorded "Little Red Scooter", which became a regional hit that he later performed on the Merv Griffin Show, among others. In the same year, he recorded "Why Don't They Understand", which registered nationally, reaching #121 on Cashbox magazine's "Looking Ahead" survey. He also made headline news for dating the actress and model Mamie Van Doren. In September 1975, after his retirement, Conigliaro was hired by WJAR TV 10 in Providence, Rhode Island as a sports anchor; in August 1976, he moved to a similar position at KGO-TV Channel 7 in San Francisco. On January 9, 1982, Conigliaro, in Boston to interview for a broadcasting position, suffered a heart attack while being driven to the airport by his brother Billy. Shortly thereafter, he suffered a stroke and lapsed into a coma. Conigliaro remained in a vegetative state until his death more than eight years later, in February 1990, at the age of 45. In commemoration, the Red Sox wore black armbands that season. He is buried in Holy Cross Cemetery, Malden, Massachusetts. Currently, the Tony Conigliaro Award, instituted by the Red Sox after his death, is given annually to the MLB player who best overcomes obstacles and adversities through the attributes of spirit, determination and courage that were considered Tony's trademarks. For the start of the 2007 season, Red Sox ownership added a new 200-seat bleacher section on the right field roof, providing an additional 16,000 available tickets for the season. It was named "Conigliaro's Corner" in honor of Conigliaro. The seats were being marketed specifically towards families. As of May 2007, the section was reserved for Red Sox Nation members on Saturdays and Red Sox Kid Nation members on Sundays. The seats were removed prior to the start of the 2009 season. However, this little section of seats (since removed as mentioned above) high above right field in foul territory was not the original "Conig's Corner". When Tony first was making his comeback, he complained about not being able to see the ball well coming from the pitcher's hand because of all of the brightly colored clothing being worn by fans directly behind the pitcher in dead center field. To address Tony's problem, these seats were first blocked off and covered in black tarp to provide a better hitter's background. This small triangular area of seats (bleacher sections 34 and 35) directly adjacent to the center field TV camera nest was the original Conig's Corner at Fenway Park. These same seats are still blocked off for day games for the same reason. ↑ Linkugel, Wil A.; Pappas, Edward J. (July 1, 1998). They Tasted Glory: Among the Missing at the Baseball Hall of Fame. McFarland. ISBN 9780786404841. ↑ "Tony Conigliaro". Retrieved 2012-05-21. ↑ Epstein, Dan. "Bloop Hits: Tony C, The First Red Sox Rocker". Just A Bit Outside. Fox Sports. Retrieved 12 July 2016. 1 2 3 "Conigliaro's Corner' addition part of Fenway changes". ESPN. Associated Press. 2007-04-04. ↑ "Fenway Park Through The Years". Boston Red Sox. Retrieved 19 August 2013.